Thousands of Bangladeshi high school students are taking to the streets demanding safer roads and justice. The violent response and suppression of media coverage casts a long shadow ahead of elections in December. 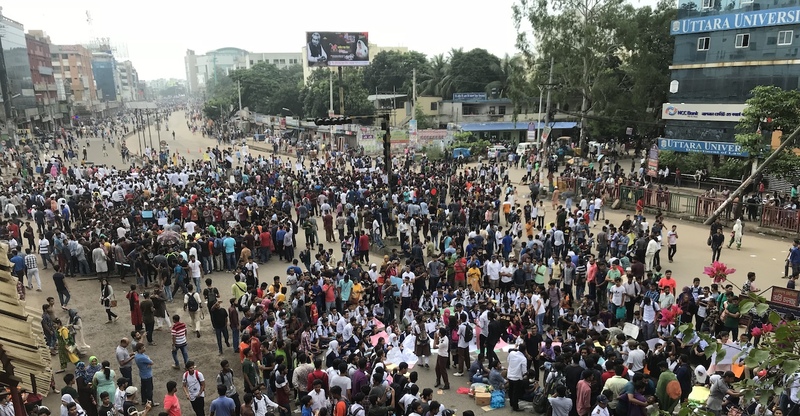 Thousands of Bangladeshi high school students are taking to the streets demanding safer roads and justice for their peers after a speeding bus ran over two schoolchildren in Kurmitola, Dhaka. 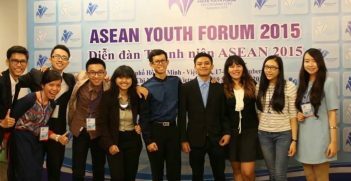 The incident occurred on 29 July, when the bus lost control and crashed into the students, leaving two dead and several others critically injured. Following the accident, when reporters questioned Minister of Shipping Shahjahan Khan about it, he laughingly brushed it aside and said, “A road accident claimed 33 lives in India recently, do they talk about it like we do here?” His egregious tone and insensitive remark sparked massive outrage across the nation. For more than a week since, students have remained on the street bus checking drivers’ licenses and vehicle fitness papers and guiding traffic nationwide. It is an unprecedented spontaneous march of students who have no political backing. The students, most under 18 years in age, have issued a list of nine demands that includes the resignation of Mr Khan, better road safety and routine fitness checks of vehicles. Shahjahan Khan is not just the Minister of Shipping but also President of the biggest transport owners’ syndicate, Bangladesh Transport Workers Federation. Over the years, the pervasive corruption and unruliness in the road and transport sector has remained untouched under the direct patronage of the syndicate and Mr Khan. Their overarching influence in the government has paralysed regulatory bodies like the BRTA, protected the interests of transport owners and prevented the implementation of existing laws. The student protesters remained vigilant on the streets for three days, organising their activities and peacefully chanting “We want justice” all over the capital. However, due to their activities bus owners went on strike halting all public transportation in Dhaka. The ruling government party Awami League soon retaliated through law enforcement authorities and the linked student political organisation Bangladesh Chattra League (BCL). On 2 August, BCL men vandalised vehicles and mercilessly beat up unarmed peaceful student protesters in the presence of police. Resolute students responded the next day by pouring into the streets in even greater numbers showing their defiance and determination. The situation is exacerbating as intermittent clashes have occurred for days with no signs of stopping. As many as 350 students were injured and at least seven are reported to have lost their lives during the clashes between BCL and protesters in the last four days. Earlier in April, the government resorted to similar pusillanimous tactics when it deployed police and BCL goons for a violent clampdown on agitating university students demanding reform in the inequitable quota system for public sector jobs. The government has slowed down mobile internet across the country in an attempt to prevent students from broadcasting live videos and posting images of the clashes. Police have detained several students who posted images and videos of the protests. Unknown men claiming to be police detectives abducted Shahidul Alam, a renowned photographer, from his house hours after he gave an interview to Al Jazeera about the ongoing protests. BCL members have beaten several on-field journalists and snatched their cameras from them on the streets. 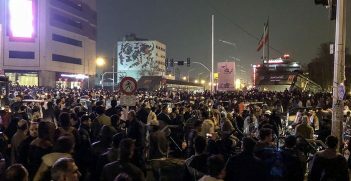 After the satellite television channel Ekattor TV aired videos of the violent crackdown, the Ministry of Information served a legal notice to the channel ordering it not to air anything that goes against the 2014 National Broadcasting Policy. Most local news channels are not airing any significant coverage on the national-scale crisis because of harsh monitoring from government agencies. With the next parliamentary elections due in December, the controversial imprisonment of former Prime Minister Khaleda Zia and the current nationwide violent suppression of dissent is quite alarming. Khaleda Zia, head of the main opposition party Bangladesh Nationalist Party (BNP), has been sentenced to imprisonment for five years on dubious charges of embezzlement and has no possibility of bail before 8 May next year. The recent mayoral elections held in the cities of Rajshahi, Sylhet and Barisal were marred by accusations of widespread rigging as government party members took position around most polling booths and impeded the access of opposition voters and polling agents. 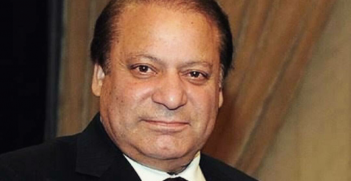 These are ominous signs ahead of the national election which, opposition parties fear, might be a repeat of the 2014 parliamentary elections when Awami League won by an absolute majority and no major opposition party participated. BNP dismissed it as an absolute farce. Earlier this year, Bertelsmann Foundation released a disquieting report claiming that Bangladesh is now under an autocratic rule. When confronted about it, Minister of Information Hasanul Haque Inu slammed the report, calling it unfounded and illogical. Under the patronage of the ruling party, its student body BCL enjoys complete impunity that allows its members to carry out violence in presence of law enforcers. This impunity has not only tarnished the image of the party itself but also stripped law enforcers of their credibility. BCL is now synonymous with terror and fear across the country as it is accountable to no one. Its members have been alleged to attack protesters, extort businesses, threaten opposition leaders, kill secular activists and commit atrocities at the behest of Awami League. To make matters worse, some police are accused of abetting BCL’s thugs instead of intervening in their atrocious activities. The government consistently deploys BCL men alongside the police to clamp down on dissidents. But this time, they are violently attacking young schoolkids who are unarmed, defenceless and have no political connections whatsoever. These heinous acts make Bangladeshis wonder, how low can they possibly stoop? Is this the nadir, or can the situation get even worse? One can only hope that the unprecedented student outrage will be the straw that finally breaks the back of a tyrannical camel. Zobair Murshed* is an organiser of the 2018 Bangladesh student protest movement around Uttara and Dhanmondi areas of Dhaka. *Name has been changed for personal safety of the author.